Sometimes it feels like the good folks at Adobe can read my thoughts and feel my pain. Every time I start to experience difficulties with my photo processing workflow they tend to solve it in the next version of Lightroom. Actually, my first encounter with Lightroom began in a similar way. It happened the year I started to take photography more seriously and I was shooting more and more. Over a period of 12 months I accumulated thousands of new images. On some occasions, I felt as if I was drowning in digital images. Photoshop was my main editing tool at the time and 100% of my processing was done there. But Photoshop was not designed to manage high volumes of photos. When my frustration was at its highest possible level, Adobe announced Lightroom. I jumped on board with the beta version, embracing it immediately and I’ve never looked back. If I analyze how my process of editing photos has changed over the years, the Lightroom pattern is obvious. In 2006 100% of my processing and editing was done in Photoshop, but with each new version of Lightroom the program became more powerful and versatile, taking bigger bites from the Photoshop pie. Now, 90% of my photo processing is conducted in Lightroom and only 10% in Photoshop. I think I could even increase the share of Lightroom to 95% but I do love Photoshop and it feels good to waste time there sometimes. The latest source of my frustration had nothing to do with the tools or features of Lightroom. The problem was the performance; or lack of it. I have about 100,000 photos in my main catalog and Lightroom 5 could not handle them properly, it was painfully slow. I ran Lightroom 5 on a decent desktop with the plenty of memory, but it did not help. When Lightroom 6 was announced and I had a chance to look at the list of new features, the first things I noticed were the Performance Improvements and GPU Enhancements, and I knew right away that this update of Lightroom was tailored to my needs once again. 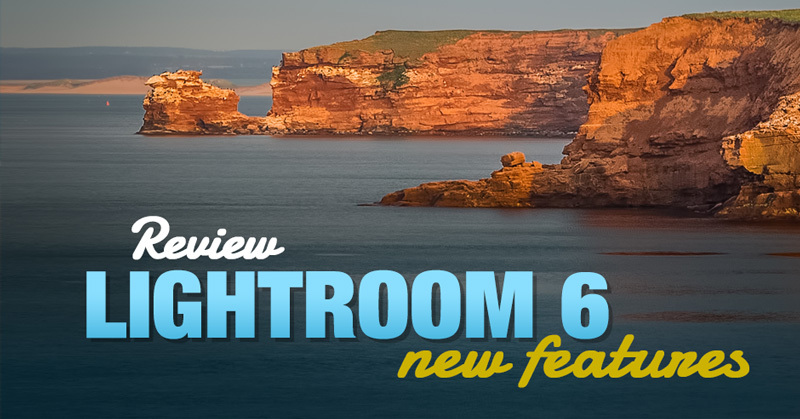 Below is my initial review and feedback on Lightroom 6’s new features and improvements after using it for a week. The items listed below are organized according to their importance for me personally and dictated by the style of my photography workflow. In Lightroom 6, you can use the Graphics Processing Unit (video card) to speed up image processing, but I don’t think it’s only the hardware acceleration that makes the difference. I tested Lightroom 6’s performance by switching the Use Graphics Processor feature off and it was still night and day compared to Lightroom 5. This means you can run it on a laptop that has no dedicated video card. Adobe claims that, depending on your hardware you can speed up Lightroom 6 by a factor of 10. I do a lot of HDR processing. I use various HDR applications to produce natural looking and balanced photos. One of my favourite HDR techniques is to use a combination of Lightroom and Photoshop; where Photoshop is used to merge multiple images to 32-bit HDR files, with Lightroom used for editing, giving the photo the final look. I outlined this technique in detail in my popular tutorial: Natural Looking HDR Guide. Now you can completely bypass Photoshop and do your entire HDR processing inside Lightroom 6. Lightroom 6 has its own HDR Merge module with the very basic Merging and Ghosting options, less advanced than in dedicated HDR programs like Photomatix but way more advanced than in Photoshop HDR Pro. There are some differences though. Compared to Photoshop HDR Pro, Lightroom 6 produced 16-bit DNG HDR files compared to 32-bit TIFFs in Photoshop HDR Pro. The file size difference is huge. The DNG files produced by Lightroom HDR Merge are on average 3 times smaller in comparison to the 32-bit TIFF monsters. In the case of my Sony A6000, the 16-bit DNG file is around 90Mb, and the 32-bit TIFF is about 280Mb. Also, Lightroom HDR Merge produces brighter HDR images compared to Photoshop HDR Pro. Below are two HDR images I created using Lightroom HDR Merge and Photoshop HDR Pro. 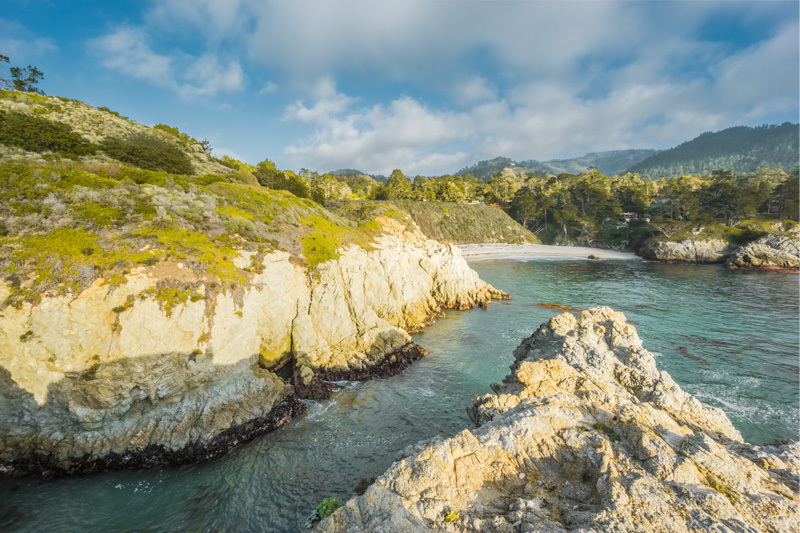 In Lightroom, I applied one of my presets from Landscape Collection (preset: Point Lobos). It looks as if I can recover more details from the 32-bit HDR image created in Photoshop HDR Pro. I still have to do more tests. This is a minor addition, but it can be a very useful and time saving feature especially if you do lots of landscape photography. It allows you to mask a portion of the effect produced by the Graduate Filter and the Radial Filter. 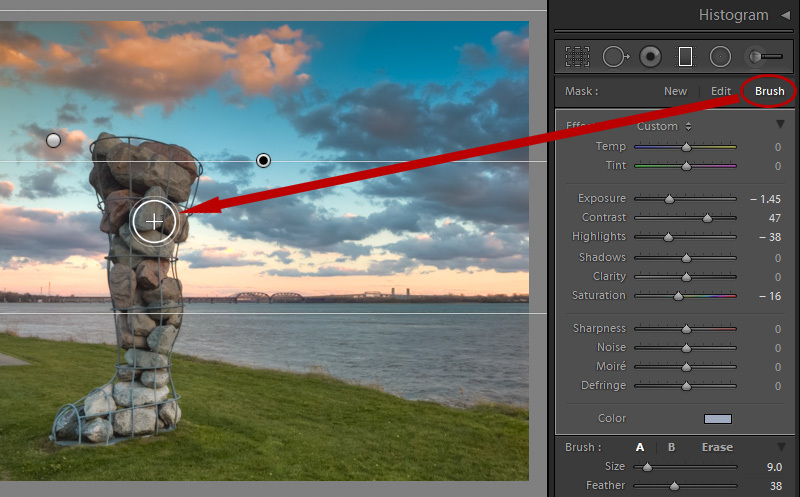 For example: when you apply the Graduated Filter to the sky area of the photo, and you have a tall building, an object or a person in the foreground obstructing the horizon, you can use the Filter Brush to remove (mask) effects from foreground objects. This is another bite from the Photoshop pie. The whole process of stitching panoramas becomes much simpler. Lightroom checks the exposure of all images you intend to combine into a panorama and automatically exposure-matches them. 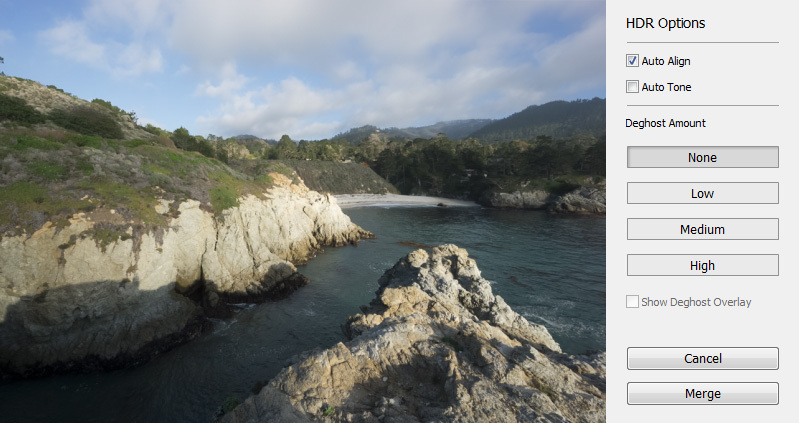 In the Panorama Merge module, you have 3 options for stitching images: Auto, Spherical, Cylindrical, and Perspective. In 90% of cases, the Auto option produces a great result. Now we can assign names to faces and Lightroom automatically finds and tags people in the entire catalogue. This is a very cool feature. Even though I only use it for my family photos I can see how it could be very useful for event and wedding photographers. Lightroom 6 is not a groundbreaking update and if not for a major improvement in image processing speed, I would probably have skipped it. At the same time, I would be willing to upgrade just for this one feature. The good news is that all your development presets from Lightroom 4 and 5 will work in the latest version. What I would like Adobe to do next in order to improve my photography workflow, is to integrate Lightroom with the main Backup Platforms, like Crashplan, Carbonite, Amazon… I would love to be able to schedule and control my backups from inside of Lightroom. I have found that Lightroom CC HDR feature, does not work in my MAC Air due to an issue with the graphics card. Does any one know how to solve it? I´ve disable it and even disable it does not process the images.